20120201 + UP and to desk. L&G home with Sam and Lena. I took a walk this very warm day. More work. 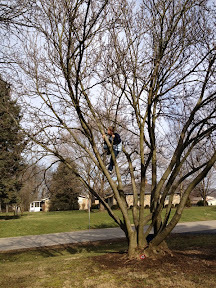 Jack playing with LEGO guys in neighbors tree. Finished work. Dinner with the fam and then played the Wii with G. All boys to bed and watching tv with L.